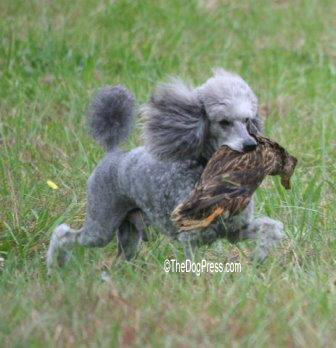 Poodle Duck Retrieving and Agility. 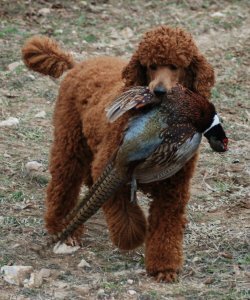 In France, the poodle was also named chien canard or caniche, indicating its duck-hunting qualities. Therefore, from its water and herding roots, it became an excellent water-hunting companion. Poodles were also used as a guide dog, guard dog, military dog, circus performer, and wagon puller for entertainers. Its coat was clipped to help it swim, but was left sufficiently long on the chest to keep in warm in cold water. but stronger evidence implies that it started as an adornment during the dog’s performing days. making it the official national dog. to perfect the smaller varieties. In the late 19th century, poodles gained access to the show ring. Some early show dogs had corded coats which had long matted or thin tresses, instead of well-brushed coats. This made the poodles look very impressive. But as a style, it was difficult to maintain and the trend ended in the early 1900s. 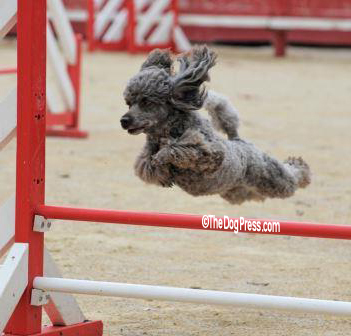 Soon, the bouffant styles replaced it and became fashionable..
Last picture of poodle enjoying agility. 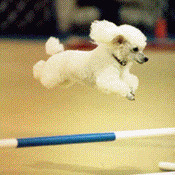 Agility first was seen at Crufts Dog Show in London, England in 1978 as spectator entertainment between events. and became the worlds fastest growing dog sport. and safely on A-Frames, Dog Walks, See-Saws and a wide variety of jumps and tunnels. for playing with their owners. Any size Poodle can compete, as the height the dog jumps depends on their height at the withers. as both gain confidence in their ability to negotiate the courses and obstacles.